Renault has revealed the 2017 Zoe, with new battery technology and improved all-electric range. The updated Zoe will reach showrooms in early 2017 and be capable of covering 250 miles on a single charge, thanks to a new 41kWh battery. This means the Zoe will travel almost 100 miles more than an equivalent Nissan Leaf, although it isn't clear at this stage if the Renault will increase the Zoe's current sub-£14,000 pricing strategy (after the Government grant). 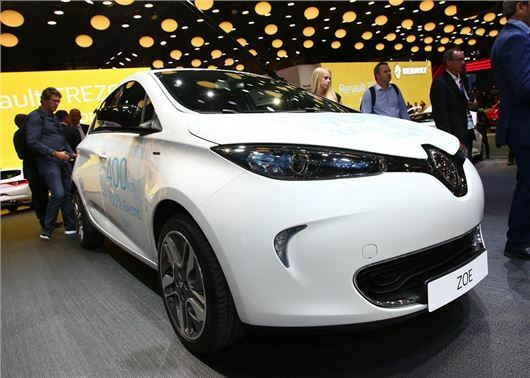 The updated Renault Zoe was launched at the Paris Motor Show 2016 and provides double the battery capacity of the previous version, without any increase in size of the battery pack. Other changes for the 2017 model includes an upgraded Renault R-Link navigation system and a new Pass app, which should make it easier to find and pay for public charging points. The app will allow drivers to pay for electric charging, as well as compare prices of nearby charging stations without being registered to particular network. The Renault Zoe was launched in 2013 follows on from the introduction of the electric Fluence ZE and Twizy, but unlike the former, the Zoe was designed from the ground up as an electric vehicle. Energy saving technology includes regenerative braking and a heater system that has no effect on the vehicle's range.